So our first day on the trail was really a 1/2 day on the trail since the bus to pick us up from base camp didn’t get us until 1 or 2pm. We went to breakfast, went back to our tents, packed up all our gear and made a pack line (yes, this is just a line of backpacks so that packs are organized and not just laying around everywhere…see pic below) at the welcome center. 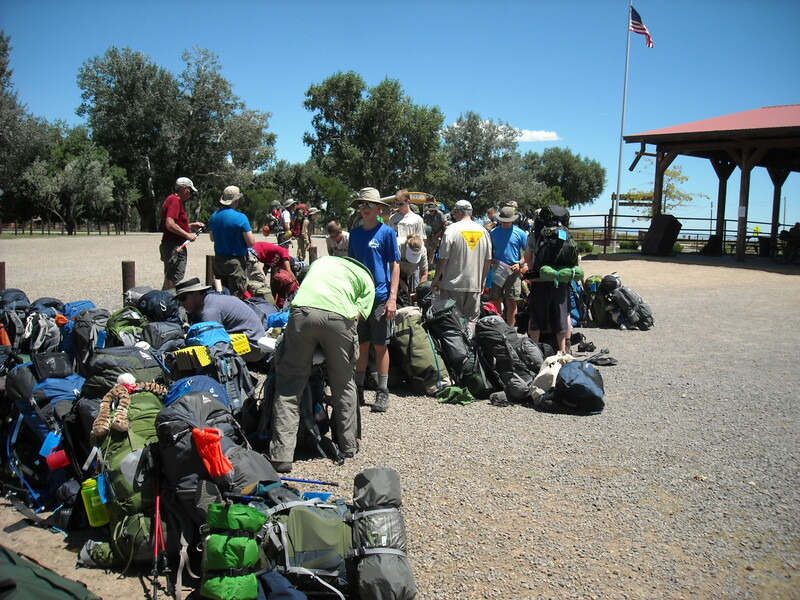 We took our extra clothes (we all brought “Go Home” bags with deodorant and fresh clothes) and other extra things and put them in lockers that Philmont provided for our crew. Since our bus wasn’t until after lunch, our ranger suggested that we take a tour of the home of the person that gave the Philmont land to Boy Scouts, Mr. Waite Philips. I know this is mean and maybe a little wrong but I don’t dig museums that much and this *IS* my blog, so I’m going to skip showing pics of the Phillips home. It was pleasant and older and there was lots of history. Lunch came and went and soon our bus to the back country came. We loaded our packs in the back and we went in the front. Once the bus was fully loaded with excited backpackers and a ton of gear, it took off to the drop off point. All the rangers (there were four crews on the bus so four rangers) sat in the front of the bus. They turned and did a pretty funny and entertaining routine introducing us to what was around us and things we needed to know. The bus dropped all of the crews off at the Six Mile Gate. Here was the first taste of “the back country” as the hills we low and rolling, the skies were spotted with clouds and blue and the rangers gathered all the crews together to introduce us to “The Red Roofs”. You see, once you leave base camp you leave toilets behind (showers too for the most part). 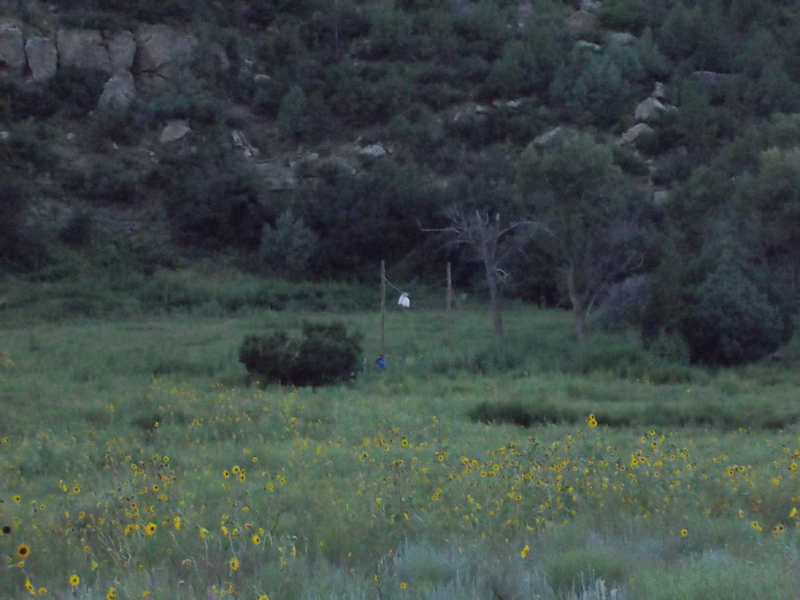 The “Red Roof” is the toilet/outhouse/privy in the Philmont back country. In most places it is a 3 sided wood stall poised over a pit and with a toilet seat for you to sit on. In order to keep the good bacteria in the pits and digesting our “output”, the only thing that goes through the hole is poop and TP. The rangers were VERY specific on this. To their credit, the red roof that they showed us didn’t really smell like an outhouse or porta-potty. They said it was because no urine went in the hole and killed the bacteria. While it may not sound like a big thing, after pooping and peeing during the same…er…session in toilets for about 43 1/2 years, it was challenging to remember “go pee before visiting the red roof”. By the smell of some of the red roofs in the farther back country, others also had this issue. Anna (our ranger) sat down with us and went over a few finer points of navigation and our upcoming trip. Why we did this in away from base camp I do not know (maybe to let the other crews start hiking already). So we found some shade and sat and talked for a bit. When she finished, it was time to actually hit the trail to our first point on the trek, T-Rex tracks in stone! We hiked to the side trail for the tracks, dropped our packs in a line (kinda) and went to see the tracks. It definitely looked like a dinosaur footprint (see pic). Our first night was to be spent at a staffed camp called Indian Writings. Staffed camps are to trail camps as The Ritz Carlton is to Motel 6. In the back country, little things make a difference. Staffed camps had friendly staff to greet us (which lifted many a low spirit), drinkable (potable) water that we didn’t have to treat, activities and a swap box of food that others didn’t want. We got our assigned camping area and one of the staff from Indian Writings showed us where it, the bear bag area and the red roof was. Our ranger took over at that point and helped us to deal with our first night of cooking dinner. Our food, as I’ve written in previous posts, was in bags inside our backpacks. Each sealed bag contained food for one meal for two people. Each bag had a number from one to ten on it and was labelled with breakfast, lunch or dinner. The number of the day of the month (the 4 of August) told us to open the “dinner” bags that had the “4” in them. 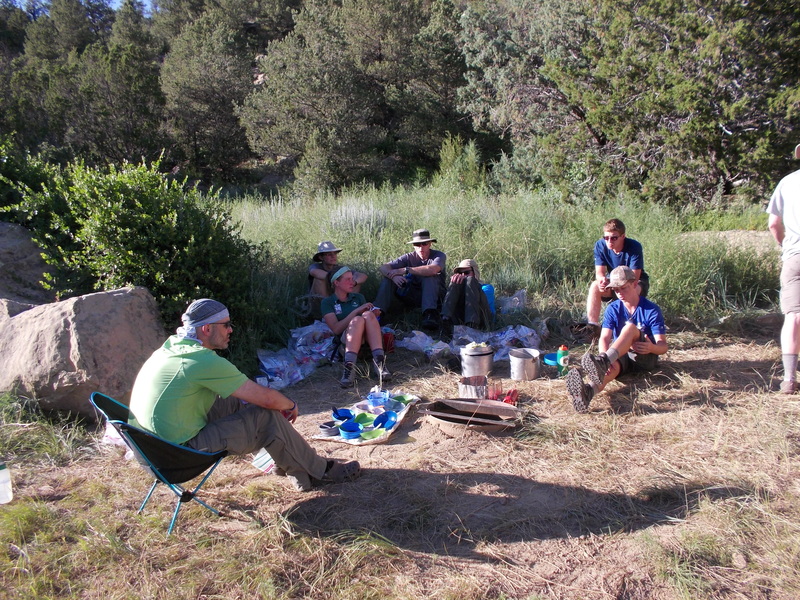 Each of us took out all of our food and put them near the cooking fire ring and waited in anticipation for them to cook themselves. 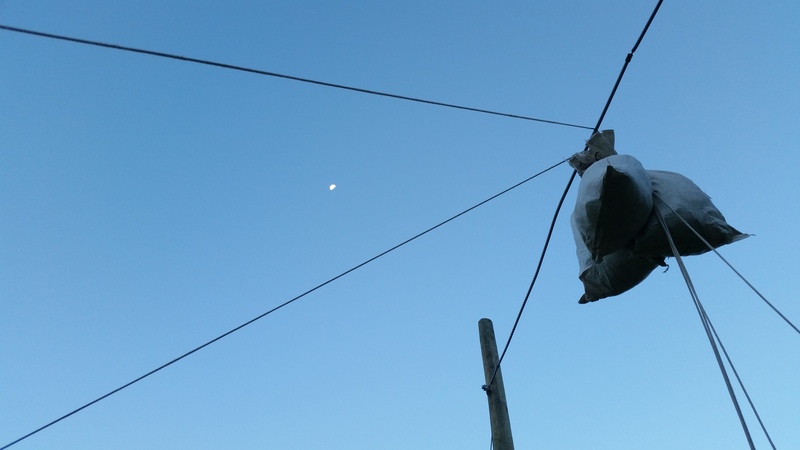 Before we could start making our food, the scouts needed to hang the bear bag to prevent bears and other animals from eating our food. We pulled out all the food that was not going to be eaten that meal and most of the scouts headed down to the bear bag area to learn to hang the bag. This was something we would have to do every night and had to get right. It would come to be an on-going challenge to get the bags hung in a reasonable amount of time in the coming days. I think I wrote before that us adults were told to back off and only take an active role in the crew if there was an issue of safety. I thought that not having my dinner cooked on time WAS an act of safety but no one else seemed to so I tried to wait patiently for Anna and her brood to return. Between us arriving at our camp site and now, all of us managed to get our tents set up for our first night on the trail. Soon Anna had shown the scouts the proper method for cooking the food and our water was set to boil. The next thing the scouts needed to learn was to “sterilize” our eating bowls/plates and utensils. Placing them in boiling water just before use made them more sanitary and hopefully would kill the nasty stuff on them. You can see them waiting to be cleaned to the left of the silver pots in the picture on the left. While waiting for the water to boil, scouts dumped the contents of our dinners in two other pots. Since my son and I ate vegetarian entrees for dinner, we got our own smaller pot. Dinners were mostly dehydrated backpacking dinners and were not bad. After sanitizing the utensils in the boiling water, some water was added to the food pots and our dinners finally started cooking. Since we were above 7,000 feet by now, we needed to wait longer for our food to rehydrate. Luckily, the dinner food bags had other non-entree goodies in them and we happily munched those while waiting for the main course to be ready. Dinner food was hungrily devoured and Anna showed us how to wash our dishes and the pots. At this point it was time to put the “Oops bear bag” up. This was the bag that contained all those smellable items that critters would love to eat and were not already in the main bear bags. Everything from toothpaste to trail snacks, sun block lotion to Chapstick was placed in this bag and hung. Our crew was very lucky that none of our food or bags were eaten/chewed-through by animals during our trek. Our other crew did not have as much luck. 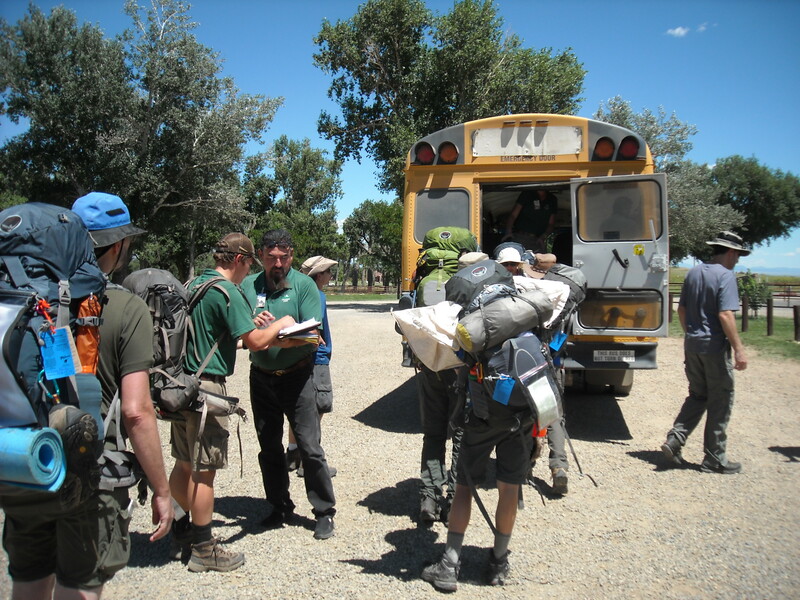 As part of the Philmont program, each night we had a variety of tasks to accomplish. 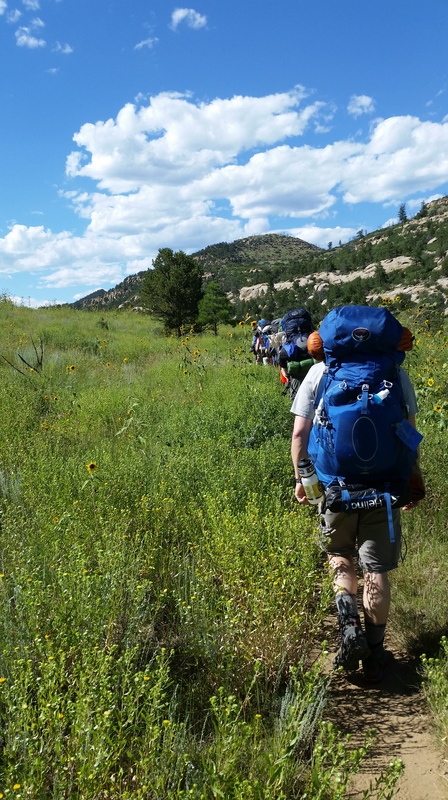 Our Gaia (nature guide scout) helped us learn about the principles of Leave No Trace and how to incorporate those ideals into our trek experience. Our Chaplain’s Aide scout performed several services and thought-provoking discussions about religious issues. Anna spoke to us about other topics we needed to understand too. During all of that, we sat in the near dark and stared at the heavens as the stars twinkled in the night’s sky. That first night was gorgeous. 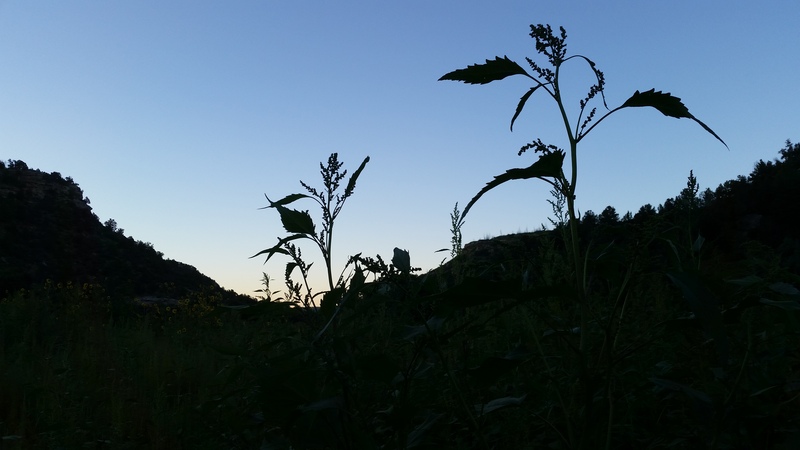 It was only about 9pm and we already started seeing meteors streak across the sky. It was the perfect end to day 1.